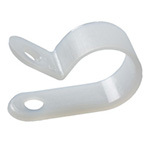 Nylon Tubing Clips are designed to mount Tubing directly to a wall, cabinet or baseboard using a Drywall Screw or Machine Screw suitable for theapplicable mounting surface. Made of Natural Nylon providing a tough yet lightweight material with resilient protection from most chemicals. Provides for an easy solution to Tubing and Power Cord Management securing Tubing and Power Cords and staying safe and organized with Nylon Tubing Clips.for use with any cable, wire or Harness. Use on Cars, Boats, Buggy's, UHV, OHV, UTV, etc. 1/4" Nylon Clip For 1/4" O.D Wire, Tubing, Etc. 3/8" Nylon Clip For 3/8" O.D Wire, Tubing, Etc. 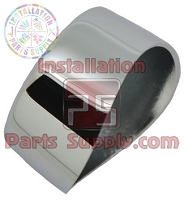 1/4" , 3/8" Nylon Tubing Clips For 1/4" & 3/8" O.D Tubing, Wire, Cable, Etc. Nylon Tubing Clips, Nylon Wire Clips, Nylon Cable Clips are designed to mount Tubing, bundled electronic cable, wire harness or wires directly to a wall,chassis or panel using a Drywall Screw or Machine Screw suitable for the applicable mounting surface. Made of Natural Nylon providing a tough yetlightweight material with resilient protection from most chemicals. Provides for an easy solution to Tubing and Cable Management securing Tubing, wire,cables and staying safe and organized with Nylon Tubing Clips / Nylon Wire Clips. 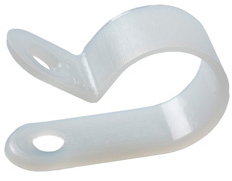 Natural Nylon Tubing Clips / cable clamps are tough, resilient, lightweight, and resistant to aging and most chemicals. Mounting hole is 13/64-in diameter.